The season finale of the HBO series, The Leftovers, was not perfect in execution. But that’s exactly perfect. In the apocalypse category, The Leftovers is original, hinging on a catastrophic non-event. The central event, which claimed a thoroughly random (Gary Busey!?) 2%of the world’s population, lacks any discernible shape at which the characters might direct (and therefore manage) their anger and fear. There was no calamity, no noise, no light. Just suddenly nothing where people had been. Along the same lines, the non-eventness of “The Departure” left no mark on society apart from the absence of the persons it claimed. In many post-apocalypse stories, the main characters are preoccupied with adjusting to new realities: disease, shortage, flesh eating zombies. Any introspection on the nature of existence happens in the small space between life or death choices. In The Leftovers, the buildings are left standing, the TV is left broadcasting, the restaurants are left open and ready for business. And people are left free from distraction from the ultimate reality: non-existence attends existence. Always. And this, apart from its beautifully sparse cinematography, apart from its actors’ brilliant performances, is why I love The Leftovers. It exposes truth. Human agency is fabulously effective, but ultimately limited. When life is perceived as a puzzle to be solved, as a race to win, there is only so much we can DO to attempt to make that happen. There are times in life when we have done everything according to the directions, when we have met challenges with stunning courage and competency, but we are deprived of a winning end result. We come to the end of our existant tether and experience existence in its bleak reality. If life is a math problem, then it solves for zero. But only at that summation is joy possible. The finale of The Leftovers demonstrates this perfectly. I was disappointed with the way the Wayne story line was not played out in camera. I was disappointed with the disappearance of Kevin’s dog hunting “friend” in the last episode. There were pieces of the story that got smudged out of focus in the haste to gather it all back in frame for the last episode. However, the events of the last episode clearly demonstrate our inability to engineer ourselves out of confrontation with non-existence. The final act of the Guilty Remnant, so carefully planned, so meticulously (and maliciously) performed was not responsible for deliverance. In psychology, it would best be categorized as a extinguishing behavior, an elevation of antagonism that is a demonstration of its perceived futility. It was a temper tantrum that did not earn them an extra cookie, an extra hour of play time before bed. Because the reality is that what they were seeking could not, in fact, be earned at all. Deliverance came in unlooked-for places. Nora, having decided to give up trying to move on by running away, finds a new beginning in an infant failed-savior on the front porch. Kevin realizes, in the relief of having his daughter restored, that life itself (not the portrait of life that he was tortured by) is all that is precious. Without any reform or obedience training, the feral dog presents itself as a friend. Lori sees in her son’s face the permission to let go of her need to overcome her first failed marriage. In the end, there was nothing they could have done to surmount the grief and anguish, except to accept that just as surely as existence is always attended by non-existence, so joy attends that tension. The acceptance is not an act of the will or a decision of the intellect, but a relaxing into our proper, human position. 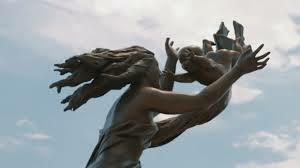 So if the final episode of The Leftovers was not able to perfectly bring about its own ending, then I say, I can’t really think of a more perfect ending.